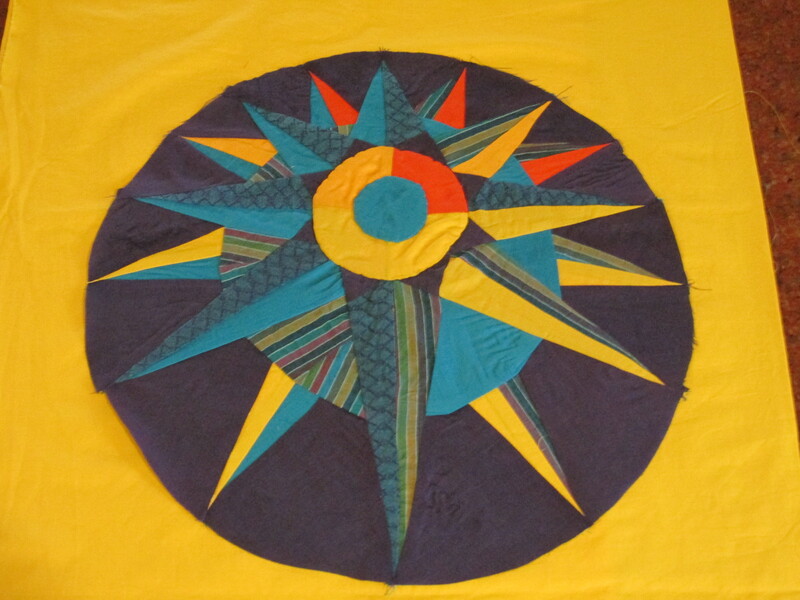 Which quilter does not have the Mariner’s Compass on her bucket list? I have been in love with the block for ages; I had to include it as the seventh block in the Round the Year Quilt! This off-centre Mariner’s Compass is a variation of the block, which is traditionally hand pieced or English paper pieced. However, this pattern employs a number of techniques, including foundation paper piecing, machine piecing and appliqué. 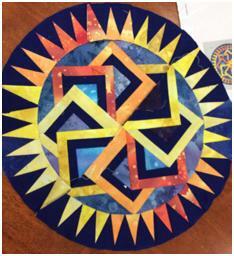 It finishes at 18″ square, with a 15″ pieced circle. The printable pdf files instructions and templates for the block can be downloaded from the links at the end of this post. The blocks were drafted on Quilt Assistant free software and I used Primo PDF to make the pdf templates. This is the Dusk colourway, the rays of the setting sun lighting up the needles on the right, as the darkness gathers from the East on the left. The name of the block came about as the pattern originally had a circle of geese , recding in size, flying upwards from both sides – I dropped them to simplify the design. Four shades of the main colour (blue) and four in a contrast colour way – yellow, gold, light and deep orange – are used here. The fabric requirements given here are quite generous (according to me! ), but you may want to cut fabric as you go along. 6″ x 42″Cut more as you need it. 6″ squares for the two large wedges at D4 and E2.6″ HSTs and QSTs can be used for the other wedges. Cut QSTs from two 6″ squares. Alternatively, you can use scraps. Instructions File – contains these instructions including the fabric requirement, piecing order and Master Template to be used as a guide for assembling the block. Template File.2 containing templates Q to X and Z . I suggest you print these on freezer paper, if available, at 100% or actual size. These are odd shaped pieces with circular edges, and I personally like to use freezer paper for accuracy for cutting these. For printing on freezer paper, cut the freezer paper to your regular printer paper size (A4 or letter – approximately 8.5″ x 11″). Iron just the edges of the freezer paper (about ¼”) to a regular printer sheet, so that they are joined evenly, without any creases. Print as usual, taking care to insert the joined sheets in the printer so that the printing is on the freezer paper. Place feezer paper, sticky side down on regular printer sheet. Iron about a 1/4″ on all edges. Print the double sheet as usual. You also need to cut a 2″ radius/ 4″ diameter circle on freezer paper/ stiff paper/ card ( for template Y). 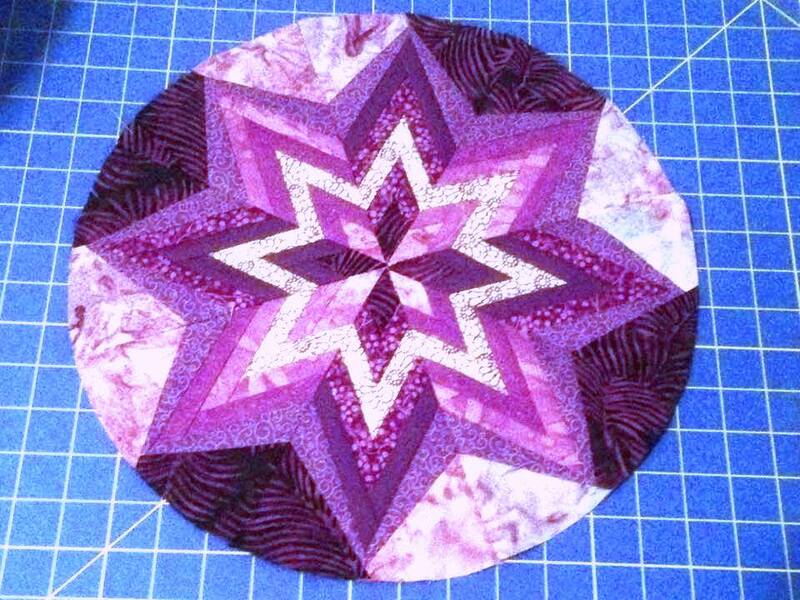 Note : The background template AA and AB are not given for this block, as the circle is appliquéd on to the square. This diagram is the Master Template that will help you in assembling the block – remember this is is a mirror image. It shows you how your block will look from the printed paper side, not the fabric side, when assembled. It is included in the Instructions File. The block is partly foundation paper pieced. I have blogged about the paper piecing patterns for this quilt earlier, and also given a few paper piecing tips here. In case you are too lazy to go through those ( I would be, I know!) here is a quick checklist before you begin! Have the fabrics been colour coded? Has the machine stitch length been reduced? Are the templates in order specified in the instructions? Have you picked up the correct fabric pieces or strip/s? The fabric code number is printed on each piece position. It is a good idea to check that once in a while. When you start, is your piece #1 placed on position #1 on the templates? Is the wrong side of the fabric piece touching the paper? Is the incoming piece placed right sides touching the previous one? If strip chain piecing the templates, have you sufficient space between one template and the next? Now to begin with the piecing! D. E, F, G, H, I, A, B, C.
Beginning with the bigger templates, you will be able to use the trimmed off scraps of fabric #1 (deep blue here). Piece templates I, J, K… to P.
Attach the wedges Q to A, R to B, S to C…. X to H using the Master Template below as guide. Make a four patch. Dont worry about accurately matched centre. 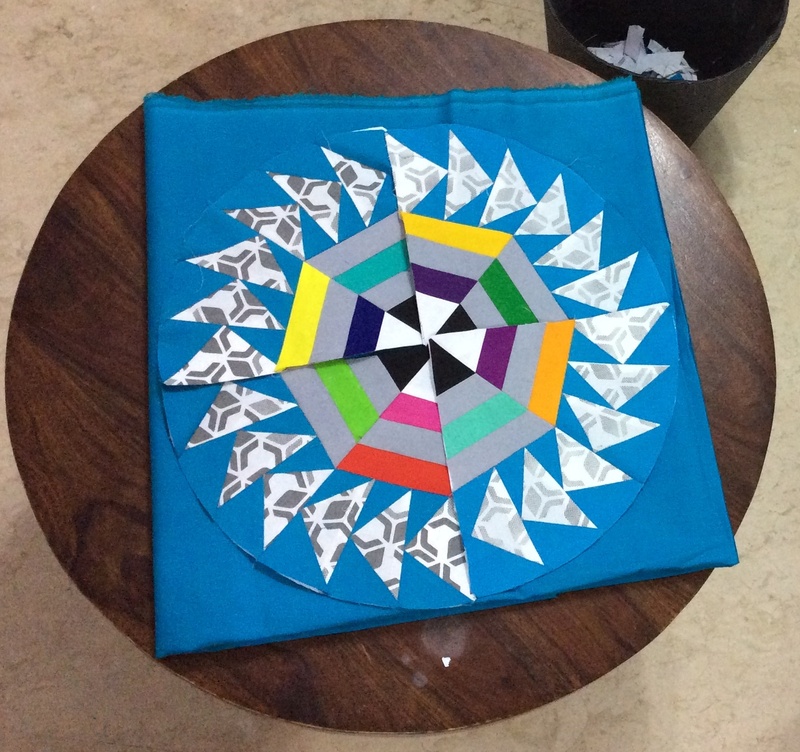 Fold the fabric circle Z twice to find the centre. Match centres and applique it to the centre of the 4-patch, using your favourite method. 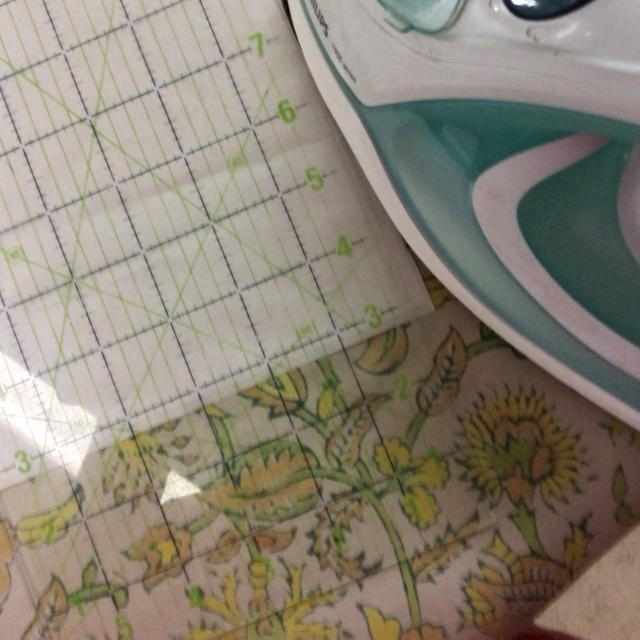 Place card template / iron freezer template on wrong side of the fabric. Trim to size – remember to add the seam allowance! This makes the inner circle YZ. Have you a print out of the Master Template in front of you? Avoid removing paper pieces before your template is ready to actually go under the machine! Arrange the templates, printed side up, using the Master Template as a guide. If you do remove the paper, ensure you have the template (alphabet) name pinned to wrong side of the pieced template, to guide you during assembly. At all times, keep the printed/ wrong side up, pick up the templates to be assembled, (remove the paper, if you wish to) sew them together. Put back in place, wrong side up. Go on to the next. At all times, remember to keep track of template names! For this particular block, assemble the outer circle A to X and then attach it to the background square AA-AB. Applique the inner circle YZ last. Refer to the Master template at all times during assembly to ensure all is in order! Reminder: If you take off the paper before assembly, remember to stick a post-it note or pin a piece of paper with the template name on the pieced template. AQ to I; BR to J; CS to K…and so on, till HX to P.
On flipping over to right (fabric) side, this is how your partly assembled templates should appear. Applique to the background square. Finally, appliqué the centre circle YZ and trim excess fabric from behind the appliqued circle if you like. 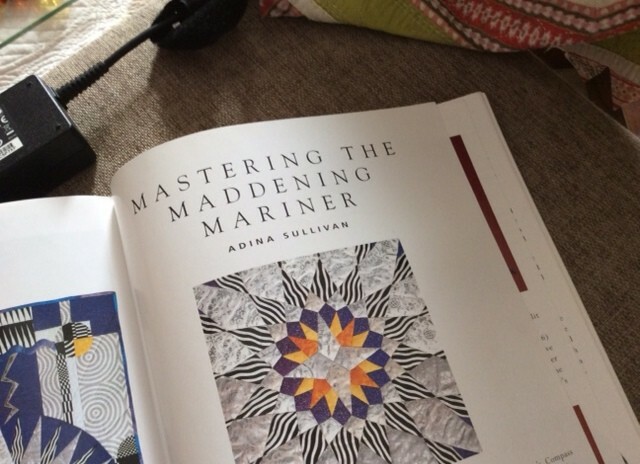 And we are done – the Mariner mastered! Before I sign off, here is a look at the Rainbow version of the block. Remember, the templates and instructions can be downloaded from the links at end of this post. Download the files from these links in .pdf format. You would need Adobe Reader, available free online to read these files on your computer. Instructions File Block07 Southward Bound containing the fabric requirement, piecing and assembly instructions. Template File.1 Block07 Southward Bound containing paper piecing templates A to P .
Template File.2 Block07 Southward Bound containing templates Q to Z . Here are versions of the card trick block I tried out before settling on the one we finally made for the Round the Year Quilt! The Ribbon Star was designed because I so wanted to try out a hexagonal log cabin. But it was abandoned in favour of the Venus , also pieced like ( half a) log cabin. By the way, this is where the Evening at the Pond block originated! Do you know I still have all the templates for these blocks? Not tested, though! They are more difficult than the blocks we are making for the Round the Year quilt. To get back to the story I was going to tell you, I started by calling this simply the Spiral Block. It was rechristened to Spiral Bargello. Roulette was another name that stuck around for a long time, for obvious reasons. I then thought of Maelstrom and even Cyclone, before my friend and fellow quilter Sobana said it reminded her of Lollipop Candy! Like the name, the block design itself underwent a number of avatars! This, here is Spiral1, scrapped, because even after removing all the curves, there are too many points to match. So I came up with a block with staggered and angled pieces, that became wider as you approached the edge of the circle. But these made me feel kind of giddy! And too loud! So, this is what Jaya Parker tested for me. …using a bargello kind of staggered strip piecing method. Meanwhile, I decided to make some further changes in the design and sent it off to Sobana for testing. Pretty? But there were a few problems with the design. For one, the strips used were different widths and therefore confusing! I also made a cardinal error in the design, ending the circle up at 16.5″ instead of 15″! So after a lot of more work, here is the final design. All the fabric strips are the same width, making the cutting easier. There are no points to match, making the assembly simpler. As for piecing the block itself, I have shared the chain strip method with you earlier, which makes piecing a piece of of cake! But very soon, as soon as I am allowed to sit and sew ( yes, my sciatica is getting better, so cross my fingers, I should be soon on my sewing table! 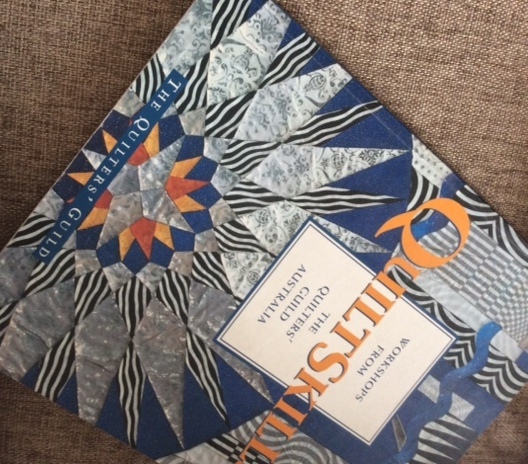 ), I will share with you the bargello metod of piecing this, with pictures! Before I say bye for the day, I must thank my wonderful testers, who have been working on these blocks with a minimal amount of input from me! I must also tell you that I have been experimenting with all these designs and colours on the amazing quilt assistant free software from www.cosman.nl. Do go and check it out! Lollipop Candy is the sixth of the Blocks of the Month of the ‘Round the Year’ Quilt. – F1 is pieced as F12, F13 and F14 remain as heretofore. The Master Template has been corrected in the Instructions File. Like the previous blocks, this is also foundation paper and finishes at 18″ square with an inset circle of diameter 15″. This block can be constructed, if you have the patience, by cutting and piecing over 350 rectangular pieces! But there are less tedious ways to make the block. There is the much simpler Bargello method; however, that involves a lot of fabric wastage and I have not yet tested it. So we will go with chain strip piecing for this block. Those of you who have pieced the Dahlia, Block One of this quilt, are familiar with the method. This is designed in two colourways, here is the Dusk colourway, which uses 4 shades of blue fabric contrasted with orange and gold, with a touch of yellow to brighten up the proceedings, against a grey background. I am using Fossil Fern by Bernatex as my fabric of choice. Before you start cutting and piecing your fabrics, please read through the entire instructions – there are a few tips which may save you more than a little heartburn! These Instructions are downloadable in .pdf format from link at the end of this post. Please print the instructions file and keep at hand. I suggest you print at least pages 1 to 5 of the file for ready reference. Print paper piecing templates (link at end of this post) at 100% or actual size in portrait mode. Note that there are the following pairs of identical templates, A-B; C-D; E-F; G-H; IJ and so on till W-X. Y is the centre circle template. Z is one of the four background templates, in 2 pieces. Glue together on line indicated. AA, AB and AC are identical to Z, hence templates for these are not provided. Use Z to cut 4 ‘squircle’ pieces from the background fabric. Tip – Pin a scrap of your fabric of your choice in Column 2 below, for ready reference. Starch and press fabric before cutting. You may also need to cut a few strips or need some scraps besides the above. Cut as you go, would be my suggestion. The Master Template – this is a mirror image! There is also an error in this diagram – piece #F1 is #F12; picees #F2 to #F12 are #F1 to #F11! The downloadable Instructions File has the revised diagram. 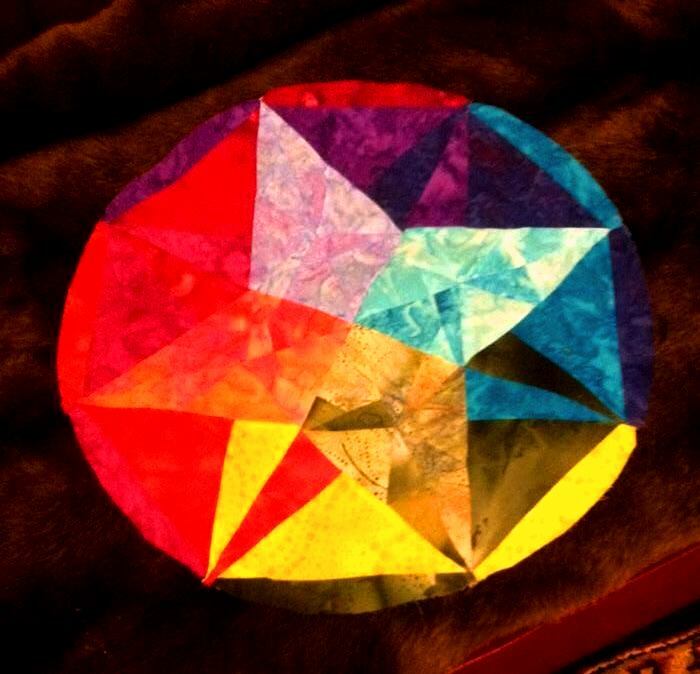 The above Master Template is a mirror image, used to assemble the paper pieced block templates. Step by Step Piecing Instructions. The piecing is chain strip piecing like we did for the Dahlia. We begin with a reminder from the previous section; arrange the templates in 4 sets, in alphabetical order; as follows , A to F; G to L; M to R; and S to X. Sort the templates as instructed. You may have noted that there are only 11 fabric strips in these sets, these will be used for Pieces# 1 to #11 in the templates. Pieces #12, 13 1nd 14 will be added after finishing this first lot of piecing on all 24 templates. The piecing is chain strip piecing like we did for the Dahlia. I suggest we work with two sets at a time, to cut down trips to the ironing table and cutting mat. Piece the templates in alphabetical order. Reduce the machine stitch length to between 1 and 1.5. Chain piece the first two strips ( Fabric #8 and fabric #6) in Set1. And remember, right sides together, always!!! Chain piecing the templates saves time. Note the `staggering’ of Pieces #1 to right on the 3rd and 5th template from top. This picture above shows your template set as it will look going under the needle. The pins are placed on the seam line for illustrative purpose only. Try to keep the seam consistent at about ¼”, move the template to adjust to the seam. In the above picture you can see that A and B are identical. But, on template C, Piece#1 is staggered by one position away from outer curved edge (on your right) as compared to A and B. So when strip piecing, we stagger the template, and begin one step away from the outside edge! D is the same as C.
Again the position of Piece#1 on template E is further away from the outside edge when compared to Templates D and C, and you again need a change in position. F is identical to E.
Are the templates in alphabetical order? Have you picked up the correct fabric strip/s? Each piece position on the template carries the fabric code number. It is a good idea to check that once in a while. Is your strip #1 placed on position #1 on the templates? Is the wrong side of the strip touching the paper? Is the incoming strip placed right sides touching of previous one? Have you sufficient space between one template and the next? Once you have ticked this checklist, it is unlikely that you will need the services of The Ripper. Chain piece the first two strips in Set2, again in alphabetical order, G,H, I, J, K and L. Here the first two strips are in fabric #6 and Fabric #4. Take to your ironing table. Press on the seams to set. Fold back the paper to expose the seam, and trim the seam to ¼” . Press open fabric strip. Cut apart the templates after every pair of strips, BUT ONLY AFTER you have pressed open the just joined strip! Now, we cut apart the templates. Preserve all the scraps, they may be useful for piecing near the centre. Don’t let the upcoming pictures confuse you, I had instructed my tester, Sobana,who has taken these photographs, to piece the templates from centre outwards. 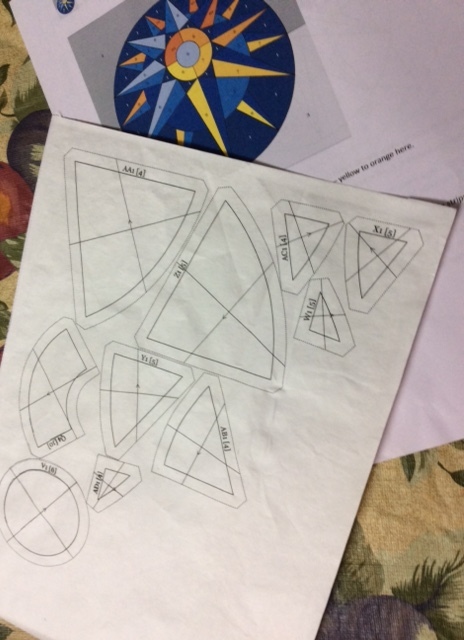 I changed the instructions here, because changing the piecing order ensures that there is sufficient space between templates. Your pieced block will be different from the pics below, as I have revised the design somewhat. But that is a story that deserves its very own blogpost. Here you will see there is insufficient space between templates. Ouch! Not enough space between templates! Another thing to remember, do not cut apart the templates without pressing open the strip! Presuming you have everything in order, finish piecing the first two sets up to Piece/Position #11. Now it is the turn of sets 3 and 4. Piece these also for positions # 1 to 11. Now judge what fabric scraps are left over. You may or may not need more strips. Cut as required and add piece #12 on all templates, working alphabetically. Refer to the colour guide, or the colour code on the template itself. Position/ Piece#13 on all templates is the innermost piece, near the centre. Use the 2″ strip of Fabric #8 for Position12 on templates C,D, G, H, K, L, O, P, S, T, W AND X.Scraps of Fabric#2 (Deep blue here) can be used for Templates A,B,E ,F, I, J, M, N,Q R, U, and V. Sew on piece #14 and our templates are done! 24 templates with 13-14 pieces apiece! How many pieces to boast of? Do not remove paper pieces before your template is ready to actually go under the machine! Arrange the 24 templates, printed side up, using the Master Template as a guide. Arrange the templates using the Master template as guide. If you want to see if all is on order, pin each template to the adjacent one on the seam line and flip over as a whole. Flipping a template at a time can be confusing, as the Master template is a mirror image! My block tester friend tried it and was really upset, as this what she came up with! Oops! Be very, very careful when jassembling the templates. Which edges go together? Refer to the Master template! So, at all times, keep the printed side up, pick up a pair of adjacent templates, remove the paper, sew them together. Put back in place, with the template name pinned on a piece of paper on each! Go on to the next pair. At all times, remember to keep track of template numbers! I would suggest you finish the assembly in quadrants. Join quarter circles to the background squircles ( Square minus circle = squircle). Applique the centre circle the last thing! Feeling dizzy? It is easier than it reads! Sobana’s gorgeous block! Unless of course, you want to piece the whole circle, and appliqué the small circle in the centre. And then, appliqué the whole Lollipop Candy to a background square. Here are the links to the (revised) templates and instructions. You need Adobe Reader to be able to download these. 1. Paper Piecing Templates, Lollipop Candy – Block Six of Round the Year Quilt. 2. Instructions (Fabric Requirememt, Cutting, Piecing & Assembly ) -Lollipop Candy – Block Six of Round the Year Quilt.